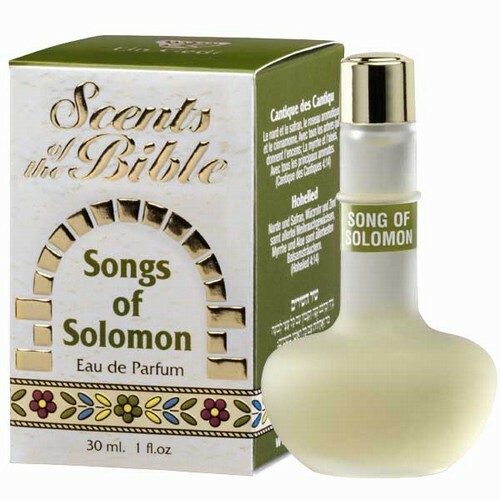 This 30ml flask of perfume carries the name "Song of Solomon", and conjures up a biblical atmosphere of love and devotion. King Solomon is described in the bible as someone who devoted his life to the pursuit of wisdom and peace. Biblical scripture includes one of his works, called Song of Songs. This book is an allegorical work of devotion using the love between man and woman as a means of expressing the love between God and human beings. The perfumed flask is hand painted and undergoes traditional manual antiquing and oven firing to achieve the special tints of ancient glass. Use this item to strengthen and inspire yourself and others so that the through modern technology, one may be blessed with the feeling of the presence of the holy spirit. This Christian gift can make a world of difference if used sincerely and with pure intentions, showing that ultimately the most important things in life are still available for the taking, all we need to do is ask.